Though that term wouldn’t enter the American vernacular for a couple hundred years, Americans began yearning for a road trip the moment the country won its freedom from Britain. By the early 19th Century, the demand for a roadway to connect the Eastern seaboard with the wilderness lands west of the Allegheny Mountains grew louder. George Washington, among other visionaries, began plotting a national roadway, building on a wilderness trail blazed by Delaware Indian Chief Nemocolin. First called Cumberland Road from its starting point in Cumberland, Maryland, Washington’s proposed National Road would reach to the Mississippi River. In 1806, President Thomas Jefferson approved the project and construction began in 1811. By 1837, the road would span five states, ending in Vandalia, Illinois. 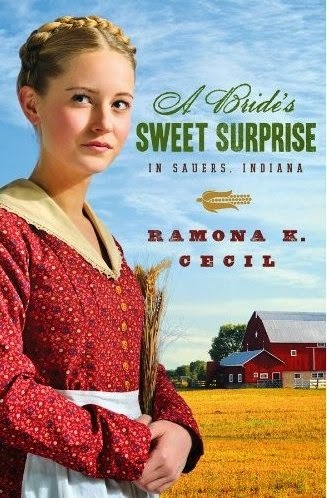 In my own state of Indiana, work on the road began in Indianapolis in 1829, extending east and west simultaneously and eventually dissecting the state from Richmond, Indiana to Terre Haute, Indiana. Over the past two centuries, countless pioneers with courage to match their boundless wanderlust have left their mark on this country along the National Road. 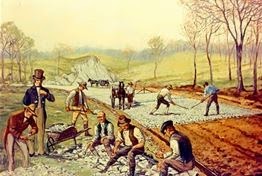 While Americans built the National Road, the National Road helped to build America. New towns and villages sprang up along the road’s route as stalwart pioneers tamed the wilderness, and the country grew. As trains of canvas-covered Conestoga wagons bore Easterners west along the National Road, the American driving culture was born. Ever wonder why we, in America, sit on the left side of our vehicles while we drive along the right side of the road? 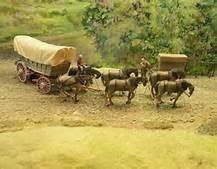 The tradition began with the Conestoga wagon drivers that traversed the National Road. So not to take up precious space in the wagon, drivers often rode along the left side of the wagon, standing on a “lazy board” plank. This allowed them a clear view as they steered their horse or oxen teams along the right side of the road. Passenger sitting on "lazy board." modest means. 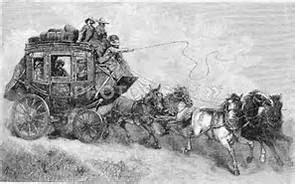 As they neared a town the stage coach driver would blow a bugle, announcing their imminent arrival. 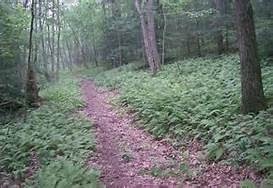 Post masters, innkeepers, and the general public would turn their attention to the National Road at the welcome sound of the bugle call. As horse-drawn wagons and carriages gave way to gasoline powered vehicles, a vast highway system was built to connect every part of the country. 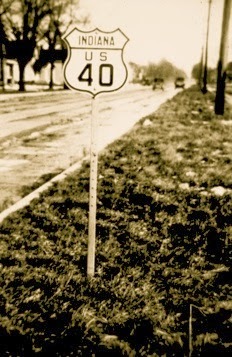 The National Road eventually became part of US 40 and connected with the Victory Highway, built after World War I, which ran from Kansas City, Missouri to San Francisco, California. 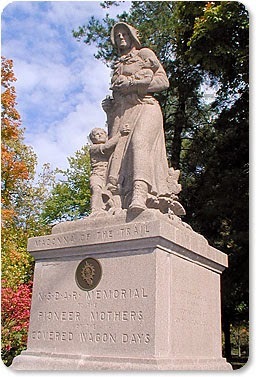 In 1911, the National Society of the Daughters of the American Revolution commissioned a monument titled “Madonna of the Trail” as a dedication to the spirit of the pioneer woman. Twelve of these monuments were installed across the country along what is called the National Old Trails Road of which, the National Road is a part. Indiana’s Madonna of the Trails monument is located along US 40 in Richmond, Indiana. 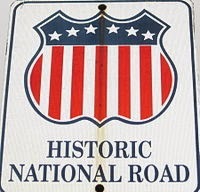 Have you traveled the historic Old National Road along US 40? If not, I have a two-word suggestion for this summer. Road trip! 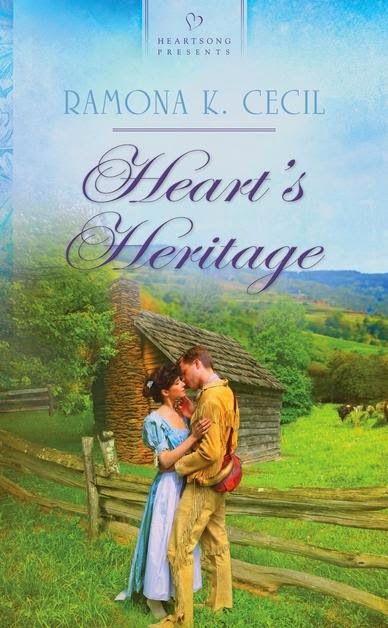 Comment on this blog post and win a copy of my book, Everlasting Promise, set along the Historic National Road. Hi, Eliza! Sometimes I think I'd like to have lived back during the pioneer days, then I think about my clothes washer, dryer, microwave oven, and dishwasher. :-) You're so right, those pioneer women were absolutely amazing! I don't think I could do what they had to do; at least I wouldn't want to have to try. Thanks for stopping by, and good luck in the drawing! We haven't made the historic trip on US40 but oh how I would love to. Nothing like getting in the car and taking in the sights of parts unknown. I love road trips! Thank you for the giveaway . Keeping my fingers crossed! Hi, Melanie! Wouldn't that be a wonderful way to see the country? My problem is I'd be stopping at every historical site along the way. LOL Good luck in the drawing! 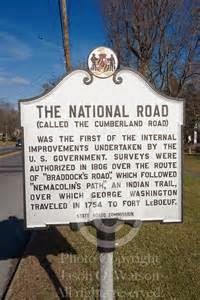 We take a road trip every year, but have not traveled along the Historic National Road. Thank you for the wonderful suggestion and informative post! Hi, Britney! I've driven stretches of it, but I'd like to at least do the entire Indiana portion in one trip sometime. Thanks for stopping by and good luck in the drawing! Hi Ramona! 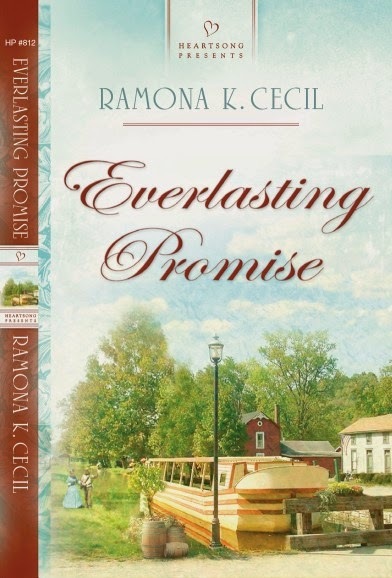 Thanks for the chance to win Everlasting Promise, it sounds like it'll be very interesting! I've never heard of US 40 and its fascinating history, but the next time I'm trying to figure out where my next road trip's going to be I'll put Cumberland Road in the running! It makes me think of Route 66. Hi, Kam. Those old US routes are so scenic. We may travel faster on the interstate highways, but we miss all those neat little towns. Thanks for stopping by, and good luck in the drawing! Hi, Sharon! I'll have to look into the history of US 50. I actually live just off 50 here is southern Indiana. The stretch of it in our town is called Tipton Street. :-) I don't think US 40 and interstate 40 are the same thing. The interstate highway system is completely separate from the old US routes. Good luck in the drawing.